Fannie Lou Hamer (October 6, 1917—March 14, 1977) grew up poor as a sharecropper in Mississippi, but she went on to be one of the most inspirational leaders of the Civil Rights Era whose fierce activism on behalf of voting rights inspired generations of activists. Fed up with the inhumane treatment of black citizens by an oppressive Southern culture (forced sterilization was among the mistreatments Hamer endured), she became involved with the Student Nonviolent Coordinating Committee (SNCC). Her work with voter registration was extremely dangerous; Hamer was jailed and beaten so severely she had lifelong health issues. But, however much she personally struggled, Hamer remained a force of life and hope for others and could be counted on to break into rousing renditions of “This Little Light of Mine” and “Go Tell It on the Mountain,” to lift the spirits of fellow activists. 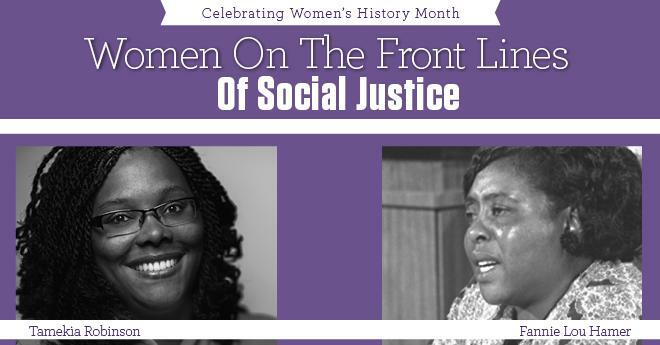 Courageous and determined women like Hamer forged a path for the women leaders of Local 1000 to continue the push for social justice that defined Hamer’s life. Tamekia N. Robinson, vice president for organizing / representation, has made that kind of commitment to social justice the cornerstone of her professional life. Rooted in a deep understanding of the power of collective action to bring about real social change, Robinson has brought her belief in, and passion for, organizing to every leadership position she’s held in the labor movement. Robinson says, when times are hard and social justice work seems overwhelming, she can look to the example of foremothers like Hamer to provide the inspiration to keep going.